On a recent trip, I was able to fully try the new service from Flightcar. If you are a regular reader of Tretakoff.com, you heard my excitement about the concept. 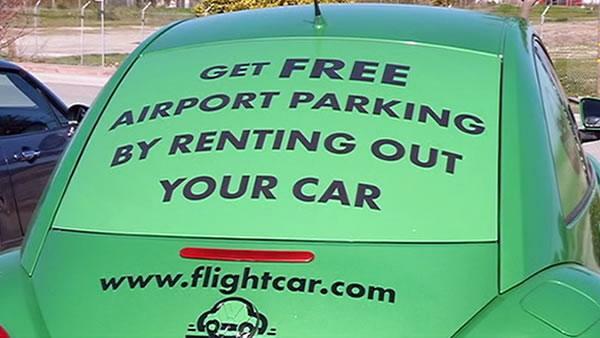 For a refresher, Flightcar allows you to rent out your own car when traveling, in return for free airport parking, and a cut of the $ if your car is rented. Since I was traveling from San Francisco to Boston, I was able to test out the full range of Flightcar's operations, as those are the only two cities they currently operate in: in San Francisco, we made our car available, and in Boston we rented a car. So, how did it go? Some prelude first. When we made the reservation for the car rental in Boston, Flightcar's site allows you to choose your car and rate, a very appealing feature. You can see photos of the exact car, get a description, and more. As I mentioned in my previous post, we chose a 2009 Lexus GS sedan, at roughly half the price of a Nissan Versa economy car from the traditional rental agencies. Very cool. When listing our car, an older Lexus SUV, I did not have any photos, and I would be surprised if anyone rented it, given it's age and lack of photo (despite the fact that it looks almost brand new and has held up better than any car I have ever owned), but Flightcar welcomed the listing, nonetheless. Hey, even if it didn't get rented, free airport parking for 6 days is a heck of a deal. On the day of our departure, I consulted the e-mail I received from Flightcar: they indicated they wanted me to call an hour out to let them know we were on our way. Odd, given the online nature of the company. Why not an app, or direct message tweet? A little old-school, but convenient if you are driving. Note to Flightcar: I think you can chuck the "Press 1 to..." prompts when you call: 99% of the calls are going to the same folks, so why not make it easier for someone who is most likely in the car? Minor quibble. After the prompt, I was immediately routed to a knowledgeable operator who thanked me for calling, and assured me he would let the staff know I was on the way. At the drop off point (slightly south of the airport), we were greeted by not one, not two, but three eager staff members, who practically sprung from their little green shed that serves as their office. All were dressed in Flightcar brown jackets, making it very clear this was an operation that knows it needs to assuage the concerns of dealing with a new operation. We pulled in, and immediately a black Town Car slid in behind us; the driver, without prompting, smoothly started to transfer our luggage to the car, while we dealt with the Flightcar staff. Professional. The staff were very patient, explaining they were inspecting the car for any noted damage, noting the VIN, and asking about our GPS, and more. Very friendly, very assuring. In moments, I signed an iPad, and we were escorted to our Town Car. Bottles of water were waiting for us in the car, and were whisked away. We chatted with the driver, a professional limo driver, asking him how he liked Flightcar and what he thought of other services like Uber. He pointed out that Uber started out well, but was now more aggravation than it was worth, as they have focused more on their ride sharing service, Uber X. He liked Flightcar, as it allowed him to pick up some extra rides when he was not otherwise engaged. He was informative, professional, and a great conversation, while having us feel the true premium nature of being driven to our terminal like true VIP's. He unloaded our luggage for us, thanked us for the tip most profusely, and we headed to our 3-hour delayed flight to Boston. We arrived in Boston, delayed by nearly 4 hours. I had called Flightcar in San Francisco to let them know we were delayed; they assured us there would be no issue. When we disembarked, I called to let them know we arrived. This time, ominously, I got voicemail after the prompts; Problem #1.. I left a message, and headed to the luggage carousel. While waiting for our bags, I called again. This time, I got a harried woman who picked up, who said "Oh, OK...it's just been crazy today. Can you call back as soon as you get your bags?" Bemused, I did, and called 5 minutes later; the same woman assured me that she was dispatching a Cadillac black car, and we should meet them in the Departures area. She took descriptions of what were wearing, and assured us it would be at most "10 minutes." 10 minutes later, no black car. 20 minutes later, no black car. 30 minutes later, no black car. Finally, the car arrived. The driver was young, clearly a bit harried, tie askew and shirt rumpled. Ok, it's a cheaper service, and I keep comparing it to the cattle cars of rental car agencies; I won't hold it against him. Still, we were clearly spoiled by San Francisco. Again, bottles of water awaited us, but his trunk was not empty: this meant he had to jam the bags in to fit them; more on that later. We drove to East Boston (right next to the airport, and turned down an unmarked service road; unnerving. He jokingly pointed to a white station wagon, and said "There's your car" with a smile. Eased the tension, as he drove past to the hemmed in Flightcar paddock. Same green shed, but two rather tired young men unfolded lazily to greet us. The driver started loading the bags into...not our previously selected Lexus, but a GMC Terrain SUV. Not a word was said, until my wife asked what was going on. The young Flightcar rep indicated he was sorry, but the Lexus was never dropped off. She had to ask to get this information: Problem #3. She indicated that we had selected a luxury car; a GMC SUV was not that; he responded that it was the best he had. She pointed to a Porsche Cayenne in the lot, and said, "We'll take that, then." He looked frantically, and then said it had been already rented. She countered that we had rented a car we had selected, so they'd have to inconvenience someone else. He apologized, but said that couldn't be done. Now, perhaps it was because the car was not available for the full duration of our visit, but he offered no explanation as such, just an apology: Problem #4. She fumed for a bit, then asked for a discount. He agreed to provide a 25% discount; I asked him to write that on the rental receipt, but he demurred and assured me "they'd note it." Problem #5. I started the car, and the gas tank was bone dry; empty, complete with gas light on. I pointed this out, and the other Flightcar young man unfolded from the chair he barely left, indicating there was a gas station "down the road" and I could return it empty. Problem #6. Finally, we got into the GMC (which was very new, clean, and fine), and drove off; the gas station was within a mile, and we fueled up, and headed out. When we got to our destination, I unpacked the luggage from the car, only to find that the entire wheel from one of my wife's nearly brand new bags had been ripped off the luggage. It had been there when we claimed the luggage from the carousel, but now, no more. It seems that the young limo driver, in his urgency to fit the bag in his non-empty trunk, jammed it so hard, he broke the wheel housing clean off. So, I had to drag the 50 lb bag. Problem #7. My wife called Flightcar to report our experience. Of course, there was no record of any of this, including the promised 25% discount. The representative was helpful, sympathetic, and promised to help solve this. He indicated he would get in touch with the owners, and took her number to call her back. No call came to her, but I did see I had a voicemail later that day. And here, dear readers, is where Flightcar did what every service company should note: they took a step back, and realized that the 7 problems we reported could either be addressed, and we could be mollified, probably never to rent from them again. Or, they could go above and beyond, and have us not only use them forever, but tell people like you why you should. And guess what? They took the high road of above and beyond. First, they apologized for having mis-transcribed my wife's phone number, and calling me instead. Next, they indicated the rental would not be discounted: it would be free. Gratis. Nada. They had credited my card back, and apologized for the experience. Amazing, right? But it doesn't stop there. They indicated they had mailed a check for the amount of my wife's luggage to my home address.WOW. Now that's what I call thinking long-term, and something that would never happen with Hertz, Avis or any other. Flightcar, you've won me for life, and it cost very little, overall. The next day, I received an e-mail from Flightcar, indicating our car had been rented in San Francisco. Quite a surprise, but my experience in Boston seems to prove that they have more demand than supply, so it makes sense. I remembered from my quick listing that if it was rented, I would receive a gas card, so I knew that was waiting upon our return. Ah, the joys of travel. On the way to the airport, I was notified our flight was now nearly 4 hours delayed. Ugh. I called Flightcar, asked if I could keep the GMC for a few more hours; they indicated it was no issue. I asked them to let San Francisco know; they agreed to do so. A few hours later, we dropped the car back at Flightcar, and noted that there seemed to be an entirely different staff there, much more like San Francisco. The staff was a bit puzzled; it seems the staff on our arrival had noted the mileage of the car wrong. I looked at it, and sighed: the previous young man had written down the trip mileage, not the car mileage. Luckily, I had not reset the trip mileage, so I showed them how to note the correct mileage, but the staff assured me it was their error, and not to worry. Much different. Into a Town Car we went, with an empty trunk, and a professional driver. No issues. Someone clearly had kicked some butts. We got in very late, 2AM. I called to let them know we landed, and they immediately dispatched a car that would be waiting for us. We retrieved our luggage (this time with a cart, since we had a broken wheel to contend with), and headed up. Our Town Car was waiting for us, with a younger, but professional, driver, who transferred our bags. Luxury transportation and water bottles to greet us; very nice. Back at the lot, we were greeted by one rep this early AM. He was energetic and professional, welcoming us home, and handing us a check for $100; it seems I had happily misunderstood the compensation for renting the car! We approached the car with trepidation, and were shocked: they had not only cleaned the car, but had professionally detailed the interior. It has not looked this good since we bought it! We noted our GPS was missing; he fumbled around looking for it, and found it in the rear, apologizing that they had not replaced it. He also provided us a card with details on what to do if we found any damage to the car within 72 hours; not sure if that's comforting, or disturbing. A few more details ironed out, a finger-signing on the iPad, and we were good to go. At home the next day, we checked the car, and it looked absolutely great. Also waiting for us was the check for my wife's luggage. All in all, this was an absolutely great experience: if it had gone seamlessly, I would have been pleased, but the fact that, when it went wrong, Flightcar not only stepped up, but went well beyond, shows me that this is the type of company I want to do business with for some time. They are focused on the customer experience, and realize that they can't just "stand pat." It's clear they have some challenges ahead, including legal ones, but this is the type of company that is not just trying to be innovative: they are trying to change the standards. That's the type of company I will always choose to do business with. Looking forward to my next opportunity to use Flightcar!